A slightly belated greeting into 2016, which we’ll be calling Heisei 28. It’s all about the reign of the Emperors, and is designed to confuse me when I come to sort my taxes out next month. 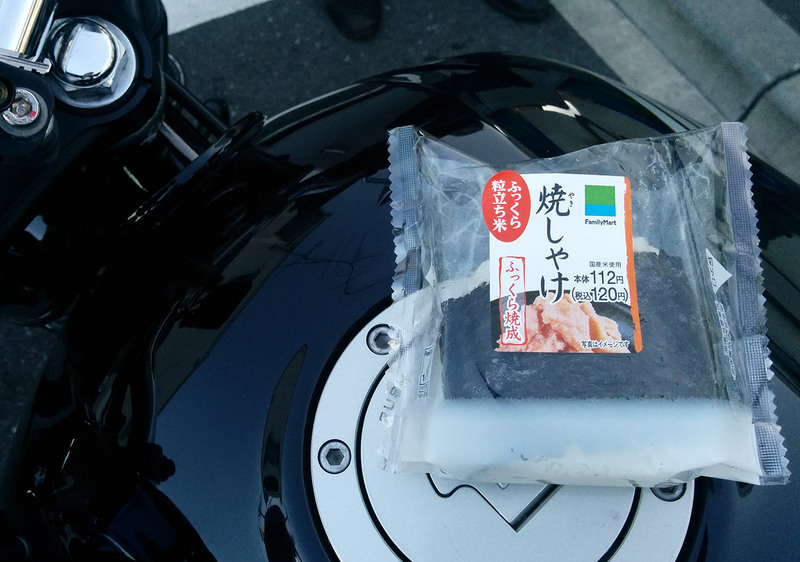 We met up at a Konbini, and I was able to get my traditional biking breakfast of onigiri, but this one was unfortunately common – grilled salmon (焼き鮭) but still did the trick. Then it was time to ride back up the 134 through lighter traffic, to meet up with a few more people at the Seisho SA, which boasts a great view of the bay, clean toilets and allows you to enjoy the quality musical coffee machines. I never get bored of this Pacific Ocean road on the bike, and just have to remember to take my turn inland – it’s easy to just keep following this road down the Izu pensinsula. From there, it was on up to the Mazda Skylounge to take in the view along the Mazda turnpike (now 520yen one way). At the Skylounge you can guarantee a good selection of people on any given day, and here on New Year’s Day I was impressed to see a steady stream of older people – alone and in groups – come up in taxis, take in the view and perhaps have a drink, then get back in the taxis to wherever they’d come from. For myself I had a cup of tea and decided to try the chili cheese hot dog. In no way traditional, or even advisable, but it did taste pretty good. No photo sadly. Here’s to hoping 2016 continues as well as it started, and all the best to everyone.